Can I Pre-Order Season Four of Lost on Amazon right now? Because I am So Owning This Season. Granted, I Own All Previous Three Seasons of Lost, The Bestest Show On Television Ever. So, Owning Season Four is not far-fetched. But, Season Four has been So Freaking Good, I can’t wait to Have The Cute Little Box in my possession so that I can Hug It and Kiss It and tell it is Really Special To Me. I have No Idea What The Fig Is Going On and I Like It That Way. If only All Television could be This Good! Last night, we got The Last of Eight Episodes created before The Strike. Lost is going to take A Little Hiatus and then be back at the end of April. Since I Live For This Show, I don’t know What I Am Going To Do to fulfill My Must See Television Viewing Habit. Sure, there is American Idol and Top Chef. But, American Idol isn’t exactly Must See TV. In fact, I usually skip The Result Show entirely and find out Who Got Voted Off somewhere on the World Wide Web, off of Viewers on The East Coast. Top Chef is Fun, but it also Makes Me Hungry. Seriously, I can’t watch that show without devouring Two Glasses Of Wine and A Crudités of Fat Free Cheddar Cheese and Olives. So, what’s A Must See Television Craving Girl to do? Maybe this is Time to Read A Book again! But, OMG, The Hills returns on Monday Night!! And The Hills is The Bestest Show On Television Ever (Next to Lost, natch)! And, so, This Must See Television Craving Girl can Lose Her Library Card and Rest Her Reading Glasses! After all, who needs Chick Lit when MTV gives us Chick Light?! Hmm. Maybe I should own The Hills on DVD, too. It's nice to know someone else loves "Lost" without ever knowing what's going on. When we watch it, I look at my husband sometimes and say, "I bet that's one of those weird clues that the other people follow." We just watch the show and enjoy it. (Cheddar cheese and olives. Mmmmmm) I hope you mean green olives. Mince green olives, finely shred the cheddar, add a bit of mayo and spread it on wheat thins. It's Yumalicious. Oh and add some frshh ground black pepper. I have never seen LOST! And the Hills not in two years! Sigh..I've been brainwashed by BRAVO! I'm totally with you on LOST!! Hmmm I've never seen the hills.. I'm guessing I should check it out? 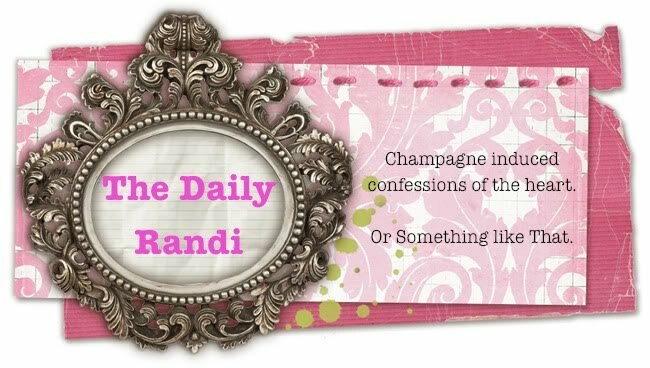 Hello The Daily Randi! Long time no comment. I couldn't go without sharing with you that we maybe have the same television brain. I'm DYING without Lost but The Hills, American Idol and Top Chef are getting me through. It's only a month - I think we can do it! I'm still dizzy from staring at Heidi's lips and Paula's rubber gloves. YIKES.